Cape Winelands, South Africa: Visitors to Cape Town looking to experience local culture should take a two-hour drive to the Robertson Wine Valley in the Cape Winelands, South Africa’s hottest new gastronomic destination. The Robertson Small Hotel, a 10-room five-star boutique hotel is the perfect base to stay during the region’s vibrant festival season in 2012. (Rooms rates start from ZAR 650 per person sharing). Hands-on-Harvest, the Wacky Wine Weekend and the Robertson Slow are just three top events of many that will take place next year the Robertson Wine Valley. 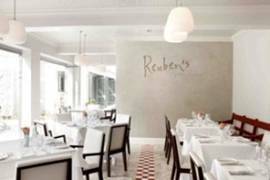 And, with its elegant combination of colonial Cape Dutch-style architecture and modern design, light and airy interiors, and its “Reuben’s” signature restaurant run by South Africa’s celebrity chef Reuben Riffel, The Robertson Small Hotel is a sophisticated yet relaxed location for a festival sojourn. This is a boutique event that offers wine aficionados and budding vintners the chance to experience the magic of harvest South African style. Activities include grape picking, bunch sorting, basket pressing, grape vs wine tasting, cooking with grapes, a family stomping day and a harvest market. South Africa’s biggest regional wine festival was named the “most unpretentious wine festival” by Wine Magazine and is a great outing for families. Activities take place at 52 world renowned wineries in the Robertson Wine Valley, such as Bon Cap, De Wetshof or Exelsior and include wine tastings, food pairings, live music, outdoor adventures, arts and sports. A slow living lifestyle festival that is designed for small and intimate groups. 26 vineyards welcome visitors into their homes and farms to dine, taste and discuss their wines and cook traditional Robertson Country Fare such as Waterblommetjie Bredie, a seven-course organic meal that includes tripe and Karoo venison. Those who want to get hands-on can learn to make salami, try their hand at making pasta or bake vetkoek, a traditional Afrikaner pastry. I would like to participate in the wine show.my email adress is lynnmuchibwa@gmail.com.We are a wine distubuting company. Hello i will like to participate in upcoming event programmed,kindly update me as soon as possible.